They may be a new name to most, but The Raven Age are about to have the kind of year that few young bands would dare to dream about. Founded by guitarists Dan Wright and George Harris in 2009, the band have recently hit their stride and begun to pick up prestigious support slots with the diverse likes of Tremonti, Mastodon and Delain. But this year, The Raven Age will embark on their first world tour, supporting Maiden on their guaranteed-to-be-epic Book Of Souls excursion. In musical terms they are a perfect fit: a young melodic metal band with elements of modern and old-school heaviness in their sound, as showcased on their 2014 debut, self-titledEP.But, this being the age of constant online chatter, they may find themselves confronted with a degree of cynicism, if only due to the fact that George’s father happens to be Steve Harris. Yes, that one. Ultimately, you would have to be a frothy-lipped misanthrope to begrudge George and his bandmates – Dan, bassist Matt Cox, singer Michael Burrough and drummer Jai Patel – the chance to see the world and refine their craft in front of huge, demanding audiences. 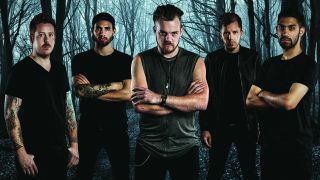 Maiden crowds haven’t always received support bands with enthusiasm, but The Raven Age are plainly prepared to fight for some respect, but only if they can contain their excitement as they wait for the tour to begin. With plans to release their full-length debut album later this year, The Raven Age could well be the UK’s next brightest metal hope. A bit of that legendary Harris determination should take them a long way.